Robert J. Sawyer hosts Vision TV's Supernaturnal Investigator. Credit: Carolyn Clink. Sawyer was at an induction ceremony gaining one of the country’s highest honours, along with a number of other Ontarian luminaries: well-known comedian Dan Ackroyd, former politician Allan Rock, international pediatrician Dr. Alan Upton, Residential school survivor Elder Geraldine Robertson, and Canadian Institute for Advanced Research head Alan Bernstein. This isn’t a new thing for Sawyer, however: he’s been proudly sporting the lapel pins and “CM” title of a Member of the Order of Canada since 2016. In fact, awards and honours are nothing new to Sawyer. He’s won all three of the world’s top awards for science fiction novels: the Hugo, the Nebula, and the John. W. Campbell award. That puts him in the rarified company of legendary SF authors like Arthur C. Clarke, Frederik Pohl, and Connie Willis. He’s also been nominated for each a variety of other times; twelve times for various Hugo awards, twice for the Nebula, and four for the Campbell. As a Canadian, he’s also been recognized a number of times by our own Canadian Science Fiction and Fantasy “Aurora” Awards. He’s received eight Auroras for best novel, five Auroras for short stories, and a lifetime achievement award. Uniquely, he also won a “Best of the Decade” award for his Neanderthal Parallax trilogy. He is one of only a very few authors to receive this award. This joins a whole host of other international awards, as well as two honorary doctorates. Sawyer’s success may be partially due to the other remarkable thing about Sawyer’s work: its unabashed Canadianness. Unlike most Canadian creators, who either collaborate on International projects (like Villeneuve) or just set their stories in other countries (usually the United States), Sawyer takes great pride in his Canadian protagonists and Canadian settings. While this isn’t unique among Canadian creators—urban fantasist Tanya Huff has had great success with series set on the streets of Toronto, in small-town Southwestern Ontario, Atlantic Canada, Alberta, and everywhere in between—Sawyer takes it to another level. His Neanderthal Parallax series is an interdimensional drama featuring the conflict between different apex hominids—and it begins with an accidental dimensional crossing in the Sudbury Neutrino Observatory, where both civilizations had coincidentally built high-energy scientific research stations. His Factoring Humanity is a thriller about first contact, quantum mechanics, and the indivisible bonds between humanity—and its lead characters are a psychologist and AI researcher at the University of Toronto. 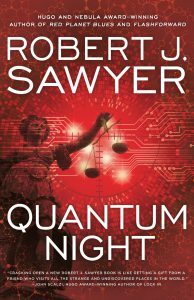 Sawyer’s “WWW” trilogy is a speculation about the spontaneous rise of sentience on the Internet, and how the rise of sentient machines could stray from the played-out cliche of rampaging robots—and its protagonist is a teenage girl who’d just moved to Waterloo because of her father’s new job at the Perimeter Institute. Flashforward was an Aurora-winning novel about whether or not our futures are predestined, and what we’re willing to do to either maintain or defy our fates, that was turned into an ABC-TV television series—and it featured a Canadian physicist who works at CERN. Mindscan, winner of the Campbell Award, features questions about the nature of humanity, lunar colonization, and conscious transfer—and a protagonist from Toronto who has his “mindscan” at a tech firm in Markham near Toronto. And his most recent book, the Aurora-winning Quantum Night, is about the spectre of undetected psychopaths in society and the dark side of human nature—and its lead characters are a University of Manitoba professor who develops the foolproof test for psychopathy at the centre of the action, and a physicist at Saskatoon’s Canadian Light Source, Canada’s national synchrotron. This makes one of his awards, the Robert A. Heinlein Award for “science fiction and technical writings that inspire the human exploration of space”, that much more important for Canadian audiences. In an email interview with SpaceQ, Sawyer pointed to his novels, Golden Fleece and Mindscan as space-focused works, and is particularly proud of his short stories, including Mikeys and The Eagle Has Landed, as examples of portrayals of space exploration. As Sawyer stands out as a Heinlein Award winner who proudly employs Canadian characters and settings, he’s carving out a place for Canada and Canadians in humanity’s future in space. He isn’t alone in this role: prominent former astronauts like the Hon. Marc Garneau, Governor General Julie Payette, and the immensely popular Col. Chris Hadfield are genuine stars. But they are representations of the present; Sawyer is presenting our future. Like many Canadians in the tech space—and despite his work’s realistically flawed human beings—he’s also optimistic about the future. That’s rare in a field so thoroughly filled with dystopia. His recent WWW trilogy was notable precisely because it was a vision of emerging machine sentience that wasn’t either a cautionary tale or dystopian warning. It suggested that, despite our flaws, sentient AI could be a good thing. Considering that even techno-optimists like Elon Musk are warning about the dangers of AI, this is a welcome corrective. When it comes to the present and future of publishing, however, Sawyer is less optimistic. Despite his awards and honors, he has said that the environment is “the worst it’s ever been economically for traditionally published authors like me”, as the conflict between publishers and Amazon has reached a stage where “publishers are squeezing their authors instead”. In correspondence, he elaborated by saying that “the publishing industry is in terrible shape”, and that he had considered leaving the business entirely. Honoured, lauded, celebrated, optimistic, but also “squeezed”: that’s Robert Sawyer CM, the Dean of Canadian Science Fiction, and newest member of the Order of Ontario.